Gridskipper said: "Reading is a great pastime for the solo traveler. We love the Red Wheelbarrow, the historic English bookshop in Marais. They have a huge selection of English language books as well as books on French gastronomy, history, and culture. It's a great place for lingering and browsing." The name of the bookstore was taken from one of the poems of William Carlos Williams, an American poet of the first half of the 20th century. The Red Wheelbarrow - the bookstore - according to their website THE English bookstore in Paris, is offering an enormous selection of titles in English in a space where every square centimeter is used up for books. 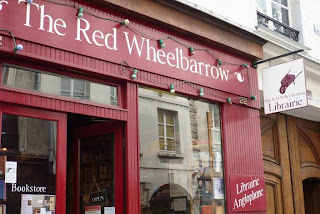 The Red Wheelbarrow can't match most of the other Parisian English bookstores in terms of history, but it has definitely managed to secure its place as one of the best stocked English bookstores of the city, which deserves a lot of respect. Besides that, the main quality of this bookstore is its friendly cozy atmosphere, and we're sure we are not the only ones who appreciate it, as the bookstore was full of visitors during our visit. 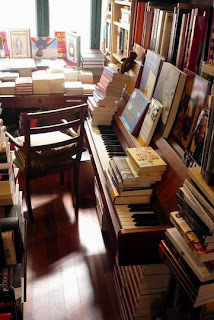 They also run a great blog, where you can follow their upcoming literary events, check out fresh book reviews, new arrivals, or just the general news related to the life of the bookstore. The beginnings of The Red Wheelbarrow bookstore date back to 2001, as it was opened in September of that year in Rue Charles V. Eventually, the bookstore has moved to its present location in the Marais, in Rue St. Paul, and it seems that it has found the right spot. The offer of this exclusively English bookstore is exquisite. They stock books on current affairs, British and American history, as well as biographies, literary criticism and essays, poetry, drama and thrillers. The bookstore also has a comprehensive French-interest selection of history, gastronomy, literature and guidebooks. The Red Wheelbarrow also stocks children's books and takes special orders for books in print for their customers. I love this bookshop. It's around the corner from my apartment and it's the best place to spend a rainy afternoon at. The staff is very competent and always helpful..also, it's 1 meter away from the Thanksgiving shop..perfect match!